Because of their circle within a circle anatomy, the Egyptians considered them to be the symbol of eternal life, and they buried them along with their dead. The Greeks, on the other hand, used them to increase the strength and endurance of their athletes before the Olympic Games. Throughout the ages they have served as food and medicine for both the poor and wealthy. What is this ancient vegetable? The lowly onion, of course. Onions (Allium cepa or bulb onions) are thought to have first originated in Central Asia or perhaps Iran and Pakistan at least 5000 years ago. Our earliest ancestors probably ate wild onions and gradually started cultivating and domesticating them since onions are portable, easy to grow, prevent thirst, and could be dried for times when food was scarce. To the Romans, the onions’ medicinal qualities included to cure vision, induce sleep, and heal mouth sores, dog bites, toothaches, dysentery, and lumbago. In the Middle Ages their antiseptic qualities were thought to cure snake bites, alleviate headaches and prevent hair loss. In North America, despite the abundance of wild onions consumed by Native Americans, the Pilgrims in 1648 planted bulb onions as soon as the ground could be cleared. Today it is estimated that the per capita consumption of onions in the United States is over 20 pounds a year. The onion is also the official state vegetable of Texas. If you want to grow onions in North Texas, Jan. 1-Feb. 15 is the time to plant them. Onion varieties are generally divided into three major categories: long day, short day and intermediate day onions. Dixondale Onion Farm in Carrizo Springs, TX, stresses that when selecting onion varieties “the size of the onion bulb is dependent upon the number and size of the green leaves or tops at the time of bulbing. For each leaf, there will be a ring of onion. The larger the leaf, the larger the ring will be when the carbohydrates from the leaves are transferred to the rings of the bulb. The triggering of this transfer or bulbing is dependent upon day length and temperature and not the size or age of the plants. When selecting your onion varieties, remember that the further north you are, the more hours of daylight you have during the summer.” The onions that can be grown in Dallas County are those varieties found in the short day and intermediate day category. This, unfortunately, eliminates some of the “specialty” onions found in some seed catalogues; however there are still white, red and yellow onions that do well in here. Most garden centers carry onion slips that are selected for our area or go to the Aggie-Horticulture website to see a list of recommended varieties. 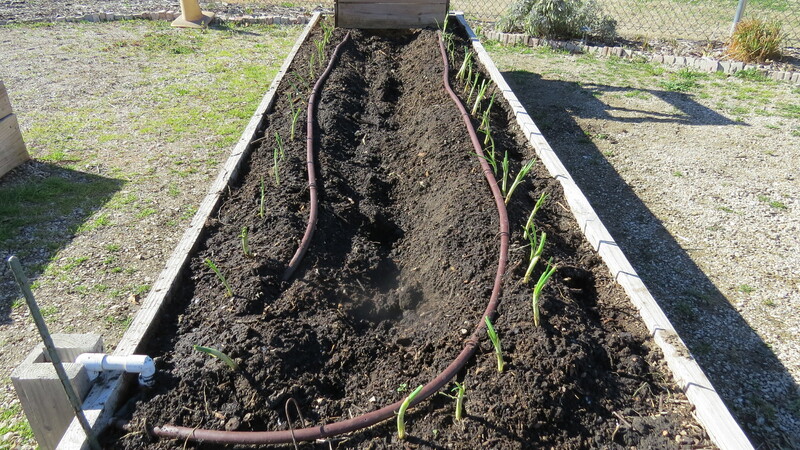 Onions prefer a loose, well drained soil and should be planted 4-6 weeks before the last spring freeze. To grow larger onions, they can be fertilized with a synthetic or organic fertilizer that has a larger middle number, such as 10-20-10 when they are first planted. After the original planting, they can be fertilized with ammonium fertilizer (21-0-0) in alkaline soils or calcium nitrate (15.5-0-0) in acidic soils about every 2-3 weeks, if desired. Stop fertilizing once the onions start to bulb. Above: Onions planted at The Demonstration Garden on Joe Field Road in 2014. Plant the onions slips one inch deep and no deeper as their ability to form a bulb will be compromised. Onions grown to maturity should be planted about 4 inches apart; however, if green onions are desired, the onion slips can be planted about 2 inches apart and every other one pulled for green onions. Water thoroughly and regularly until the tops turn brown or yellow and fall over, then cut back on water. 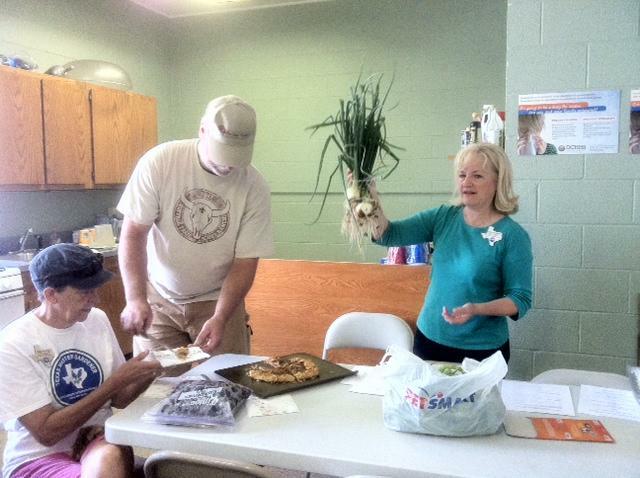 At this point a fully mature onion should have about 13 leaves. When they are harvested, dry them thoroughly for several days to avoid problems with rot. The entire neck (where the onion meets the bulb) should be dry and not “slip.” Once the onions are dry, clip the roots and clip the top to 1 inch. Store them in a cool, dry, well-ventilated location if not consumed right away. Any onion that shows signs of rot should be removed immediately. In general, according to Dixondale, sweeter tasting onions do not store as long as the more pungent types. So, plant yourself some onions—and Bon appetite !! More about onions click here and for onion recipes click here! Posted in Vegetable Gardening in Dallas and tagged bulb onions, green onions, Onion Planting, Onion varieties, vegetable gardening. Bookmark the permalink. Its a very Good Information about Onion Planting. Its really Nice i get some knowledge about onion Planting process,Hope to see more posts …. thank you. We will be writing more about veggies, keep in touch with us!